We’re in Tillamook, Oregon visiting with Lynne. Luckily she's right next door to Tillamook RV Repair, because on our last night before driving here, our bedroom slide would not stow properly. The rear of the slide was a good 6 inches away from the coach, while the front of the slide was flush. So our stay can easily handle a dual purpose – spend time with Lynne, and get our slide fixed. The first day here, our motorhome was in the shop all day. They put the slide in and out, over and over and all they could tell us was … yep! There’s a problem! Luckily, we can live in it with the slide closed, so they manually closed it up and we drove back to the RV park for the night. The next day they worked on it some more and determined that they needed a ‘sensor.’ This needed to be ordered from the manufacturer – Power Gear – and it would take a week or maybe more. So we wait. Meanwhile … we went out in Netarts Bay early one morning to catch crabs. Lynne’s friends, Bill and Carol, go crabbing and fishing all the time. What a treat to get a boat ride on the bay. It was an overcast morning, but it didn’t rain. We dressed for the cold and had a great time. Bill and Lynne did all the work, while Carol, Jim and I were spectators. We could get up close and personal with a bunch of seals on a sandbar. We also got out for a little walk on the sandspit that forms the barrier for the bay. It was a fun morning, and it made for some delicious eating later that night! Then, another day, we took a drive up the coast to look at the Thousand Trails park called Seaside. We plan to stay there for a little while too. We stopped and walked on the beach at the town of Cannon Beach, with the famous Haystack rocks. And, also at a stop called Hug Point. A hug sounded like a good idea! More pictures on our July photo album. Is it a sad, depressing occasion to mark the passing of someone who died too soon? Or, can you celebrate a life well-lived? John Wrightson was 64 years old. That’s young in today’s world, yet he lived a full, fun, and adventurous life. They found tumors in his brain in February of this year, and he succumbed in June. See our photo album of John here. And the party was perfect too. A gorgeous day on the Oregon coast and lots of good people who loved and cared for John, and will continue to love and care for Lynne. More pictures of John’s party at Happy Camp. 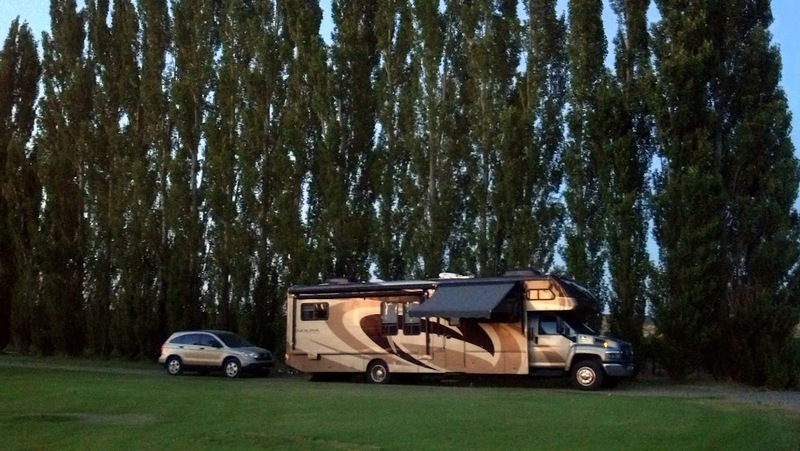 Lynne and John were the first full-time RVers we met in our new lifestyle, back in 2003. We met up with them many times all across the country – Fort Lauderdale, FL; Austin, TX; Quartzsite, AZ; Redmond, OR; Gravity, IA; Celina, OH and many more I’m sure I’ve forgotten. It’s a different, and wonderful, lifestyle. We know how close you have to be to live this way. We’re so glad that we were able to be here for the party. Eastern Oregon is pretty bland until you reach the Columbia River. Then WoW! One of our favorite spots in all our travels is the replica of Stonehenge on the north side of the Columbia River. We made sure to pay attention and snapped a shot of it as we drove by. It looks so small from this distance – yet it’s quite impressive when you’re standing within it’s stones. I can’t imagine how large those windmills are if you’re standing right under them. We didn’t do much sightseeing or spend any time. We were just on our way to Tillamook. We met the folks from Harvest Hosts a couple years ago, and thought they had a great concept. 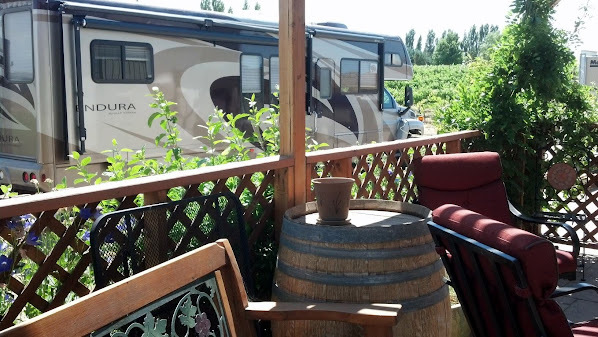 They contact wineries, farms and other unique locations that are ready, willing, and able to host RVs parking on their property. Then they promote these places to RVers and ask that they become members of Harvest Hosts in order to find out about all the great places to stop. It’s a small yearly fee, currently $40. The RVers get a cool place to stay for a night at no charge, and the Host gets some exposure to their facility and/or product. As lovers of wine, we felt this would be a perfect thing for us, but we just now got around to signing up for a membership. We spoke with Don and Kim, from Harvest Hosts at the Escapade and told them our upcoming route. We looked at the options and figured that Cold Springs Winery, in Idaho might just work out as a perfect night stop. When we got close, we started looking around. I said, “I’ll bet that’s it up on the hill.” It looked like a little piece of Italy with the tall poplar trees. The description said there would be about a mile of dirt road, but it was well-marked and wide. Not a problem at all. As we got closer, we passed by lots of vineyards – covering the hill. When we got up the hill, the first building was the tasting room. We found Bill, the owner and he directed us where to park then said to come back to the tasting room to … taste! And, here’s the view of the valley below. We had a delightful time with Bill chatting, and tasting his wine. Here’s the thing about wine … we had an even better time as the afternoon went on! It was quite hot – around 100 – but we didn’t care! After our tasting, we had to run the generator in the RV so we could have air conditioning. There are no hookups here. The heat was even too much for our A/C and we basically just napped the rest of the afternoon. It did cool down into the 60s come dark, so sleeping was fine. I’d say our first stop with Harvest Host was a roaring success! We knew we would enjoy staying at a winery, we figured it would be picturesque, we knew we would enjoy a tasting and probably buy a bottle of wine to keep. But, we didn’t count on liking every wine we tasted so much that we had to buy a whole case! And then came the most scenic mountains of all … the Grand Tetons. It was the sight of these mountains in our first year of travels that literally brought tears to my eyes. They are exquisite. They are the charm school graduates of mountain ranges. This is why we travel – you just don’t see sights like this in normal city life! The cloudy skies made for less than brilliant pictures, but being in the presence of the Grand Tetons was still a humbling experience. WE even caught a glimpse of some Buffalo … err, Bison. We managed to spare a few minutes to stop and the National Park Visitor Center and get our Nat’l Park Passport book stamped. The visitor center building was quite an experience in itself. Huge windows to fit the view! The sun even peaked out for a few minutes. And, we weren’t done yet! After leaving the Tetons, we took the road that followed the Snake river – it was a beautiful canyon itself. I was starting to get tired by this point … and I wasn’t even driving! We didn’t have any reservations for the night since we had no idea how far we would make it. It looked like we could get into Idaho Falls before dark, so I looked at our Allstays app on my smartphone and saw that there was an Elks Lodge in Idaho Falls. Unfortunately, when I called them, I was told that they already had 2 RVs parked there, and that’s all they had room for. So, we just found a rest area and pulled over. OMG … I can’t imagine a better spot to rest! It was overlooking the Snake river, and we happened to be there right at sunset time. As if that wasn’t enough! Would you believe that we had 5 bars of 4G on our smartphones?! So we were able to zip along on the work we had to do before bedtime. Here’s the picture we took of our parking spot the next morning. First of all, we were exhausted … exhilarated, but exhausted … after 5 rallies in a row, 20+ seminars and one 2-day hands on class. We left Gillette mid-day on July 4. July 4 is our anniversary and we wanted to repeat our first anniversary during our full-time RVing life. 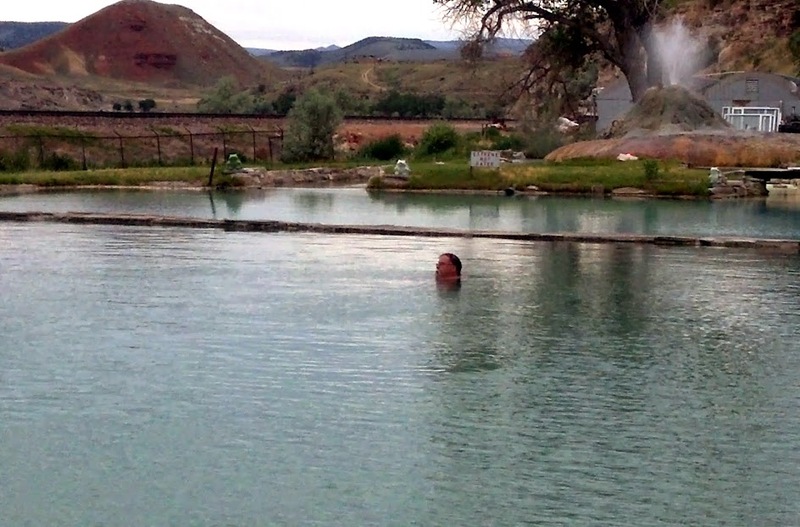 In 2004 we discovered a fabulous hot springs in Thermopolis, WY and that’s where we spent our anniversary. What a gorgeous drive it was over the Powder River Pass thru the Bighorn mountains and south to Thermopolis. We arrived at the Fountain of Youth RV park about 5 o’clock, already feeling relaxed and renewed. Filled with the beauty of the Wyoming mountains. After we got parked, we quickly changed into bathing suits and went straight to the hot springs. They’ve added a new barrier in the pool since we were here last. Now you have the choice to stay in the north third of the pool which is about 100 degrees, or climb into the middle section at 102-104. 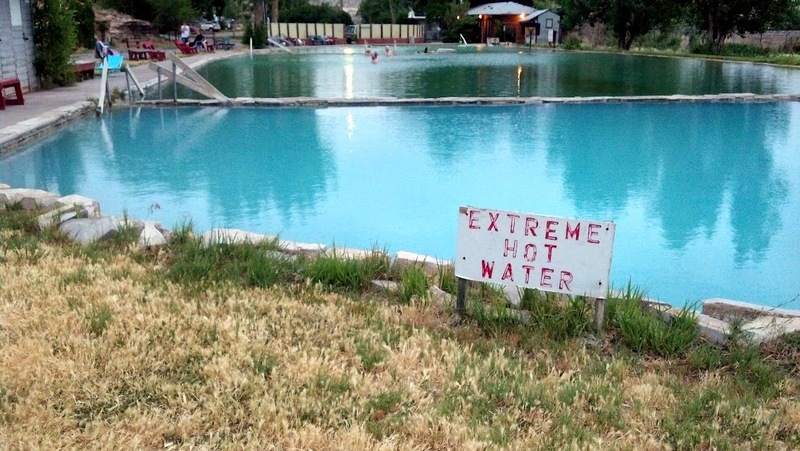 The third, southernmost section is too hot for people … sane people anyway. The little volcano at the southern end is where the hot springs is coming into the pool at about 128 degrees. The next day we started with another soak. 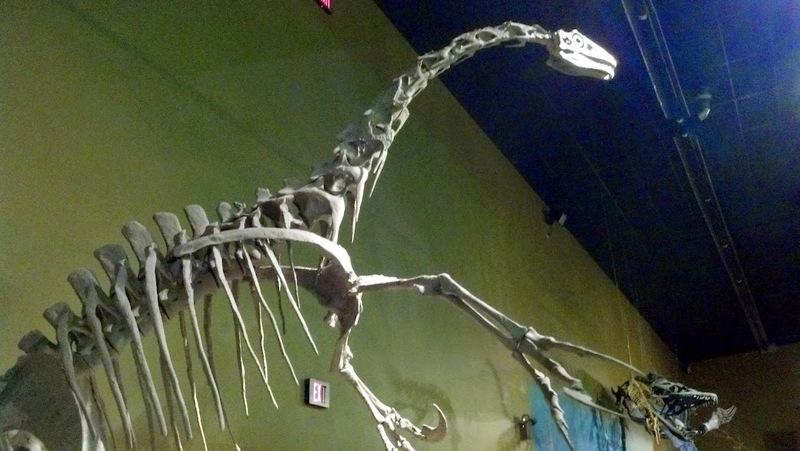 Then we went into town and had breakfast at the Thermopolis Café, then visited the Dinosaur Museum. Once we were in the tourist mode, we just kept on going. 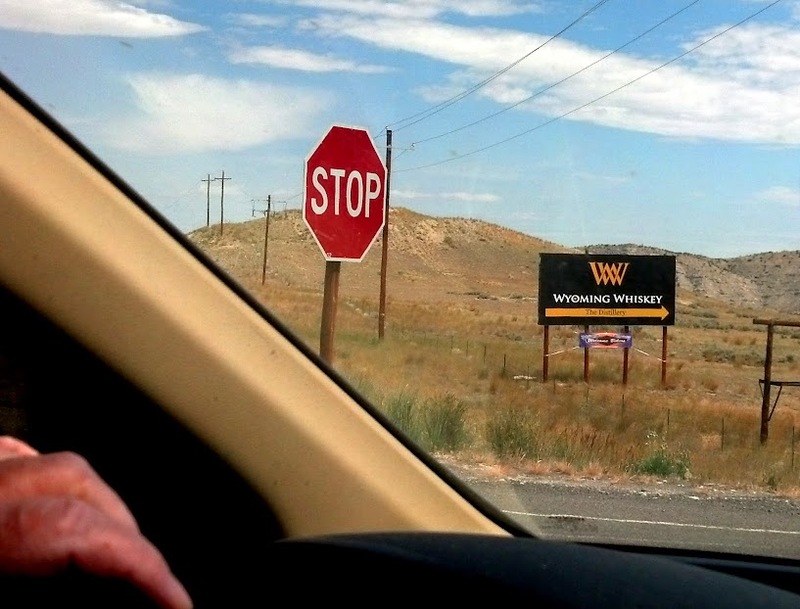 We had seen a sign back up the road a ways for tours at the Wyoming Whiskey distillery. Umm … OK! Hey! It said Stop … so we did. By the time we got back home, it was NAP time! No phone, no Internet. Started the day with a hot springs soak, then played tourist, tasted Wyoming Whiskey, had lunch at a great hamburger place. Now THAT’s a recipe for relaxation. We napped for the rest of the afternoon, then repeated the night before of soaking, swimming, and listening to music.